May, the perfect time of year for that first hike, that get-you-back-in-the-woods-without-killing-you hike. It was the weekend of the Flags on the 48 Planning Meeting, which appropriately enough was held (near) the White Mountains. Dome and I were planning to attend the meeting and just couldn't give up the opportunity to hit a peak while we were there. The planning meeting was held in Woodstock on a Saturday, and with a two year old waiting for me at home, I couldn't make a whole weekend of the trip; so, I started looking for a shortish hike that would allow me to get my legs back and yet not take the whole day. North Kinsman looked a little too long, so I checked out Cannon. Once I saw the hike length, I knew I had found our trip. 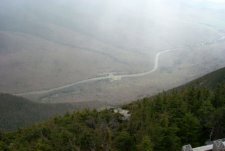 The White Mountain Guide tells us that the Kinsman Ridge Trail travels for 2.0 miles to reach the Rim Trail, but gains 2100 feet in elevation. My feeble mind should have sent up warning signals at this point, but in my delirium to go hiking, I lost all faculties and decided to go anyway. After setting up our "two bedroom condo" (as Dirt_Girl called it), Dome and I set out for Cannon and found about 200 places to park in the Cannon Tramway parking lot. At exactly noon, we began our first hike of the year. The trail begins ever so slightly south of the parking lot and parallels the ski trails. We immediately realized that a warm up and stretch session would have been smart as the trail begins to climb almost immediately. Walking through a healthy variety of deciduous and evergreen trees, we spotted some seriously old birch specimens that kept our minds off our burning lungs. Footing was a little difficult in spots, as the trail meanders through some disintegrating scrabble early on. 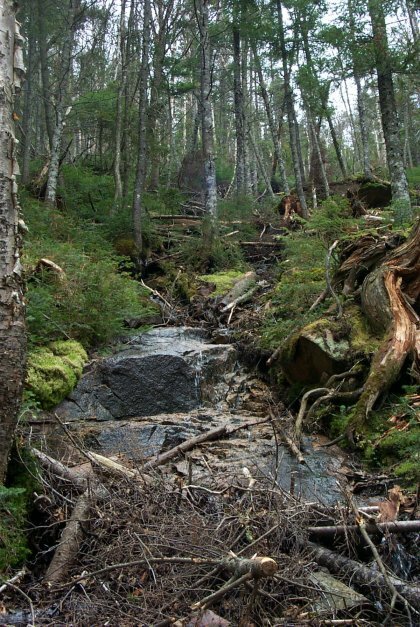 A quarter mile up the trail, the footing becomes more rocky as the trail gets steeper to almost uncomfortable angles and you gain elevation consistently. 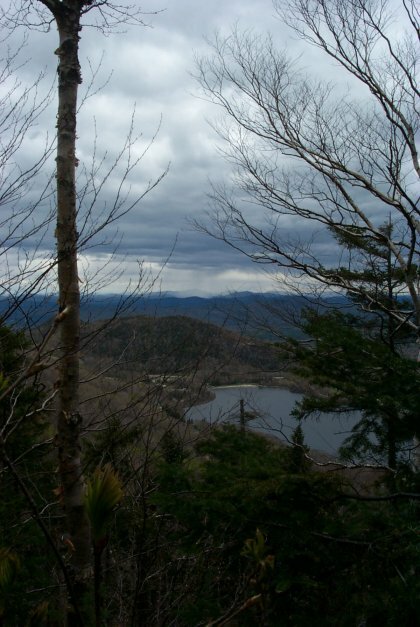 Before too long, decent views to the north are available, and Echo Lake quickly becomes your first vista focal point. It seemed like there was a lot of trail maintenance going on; Dome and I noticed that there were a lot of trees cut down. We each had our theories about why the trail was cleared so widely, but in the end neither one of us really had an explanation. About a mile into the climb, the trail turns left to follow a fairly obvious runoff, and there is a big yellow sign that indicates that the trail turns left. 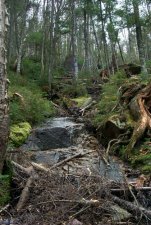 The trail was consistently rocky and steep up to this point, and as the trail turns into a more evergreen dominated forest, we see our first real signs of snow. The lack of sunlight in this area reveals why we're seeing snow at this point, but it's all good and we keep moving. The snow makes footing a little more difficult, but in warmer weather the trail between 1.0 and 1.5 miles would be fairly sturdy. The trees provide good cover from the wind, and we were quite comfortable for this part of the trail. 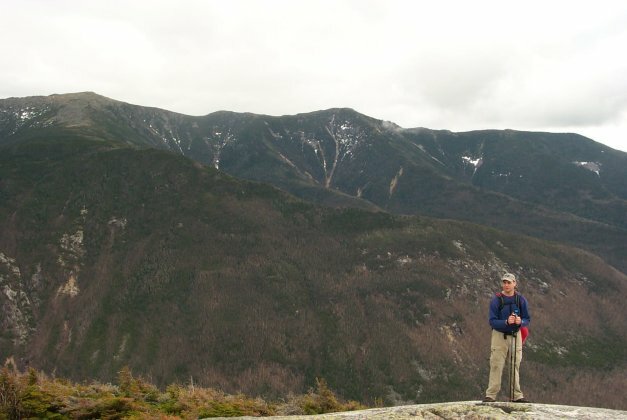 At 1.5 miles, our patience and effort were rewarded with a spectacular "outlook" of the Franconia Range, including Lafayette, Lincoln, and Little Haystack. From here the observation tower was clearly visible, and Dome and I both felt a little surge of energy, so we moved on toward the summit. 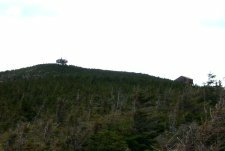 The Kinsman Ridge Trail is flat here briefly as it winds around a very small peak, descends, and begins the modest climb to the top of Cannon. Views to the South and East are prevalent at this point, and on a clear day you could probably see 50 miles or more. We made our way up the rocky slope for about .2 mile when we merged with the Rim Trail. At this junction there is a nice bench and a post for a pay binocular, which was removed (at least temporarily). 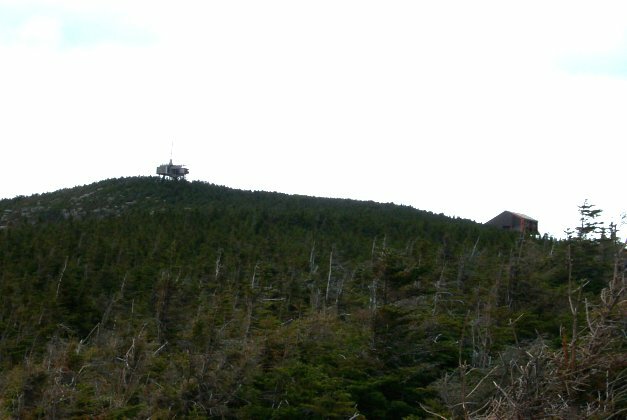 At this point, we could stay on the Kinsman Ridge, or take a cutoff to the Tramway House; either direction would get us to the summit eventually. 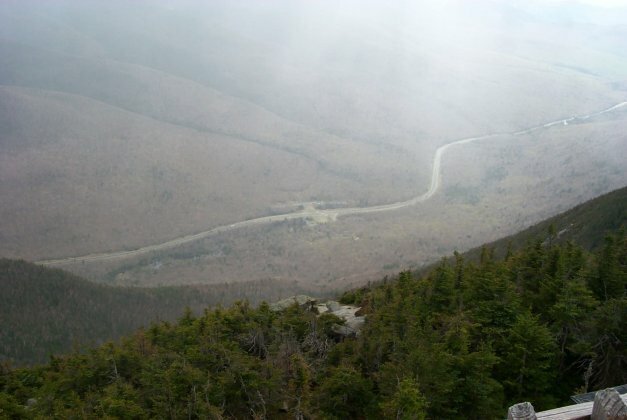 We chose the Kinsman Ridge which joins the Rim Trail. A short walk and we reached the summit and the observation tower just as the rain started in earnest. Total hiking time, 2 hours 15 minutes. 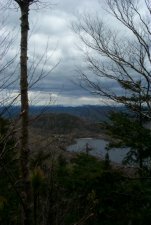 We couldn't come this far and not climb the observation tower, so we clambered up to the top and hid behind the tower itself while snacking and enjoying what little view we had. Before long, the wind and rain convinced us that being up this high was not all that smart, so we climbed back down and followed a path to the Tramway House. Some decent views were available here, but in the rainy weather we decided it was best just to head back. So, we followed the Rim Trail back to the Kinsman Ridge Trail and made our way back down. An hour later we were at the truck and ready for a couple frosty beers. Our overall impression of this hike was very positive. 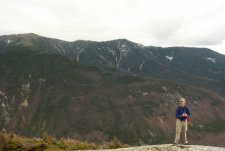 We were looking for a half day hike that gave us a bit of a physical challenge and some decent views, and Cannon definitely provided that. In addition, this was a fairly low-stress hike, because the whole time we were a few hundred meters away from the ski mountain, which provided some level of comfort. The total distance from beginning to end was about 4.4 miles and 2100 feet in elevation.